InPark Magazine – This is How Weber ROCKS! This is How Weber ROCKS! What makes a happy rock? For the Museum, Weber’s mission was to build an exact replica of this raw and natural cave, including stalactites hanging from the cave’s ceiling, for the Museum’s upcoming debut of their Scienceworks Exhibit. This interactive exhibit explains how a cave is formed within our ecosystem and Weber’s job was to make it look and feel just like the actual Marengo Cave. A deeper dive into the conversation on the methodology of rockwork ensued. My team, a group who refer to themselves as “The Rockers,” gave me a full download on the intricacies of this aspect of our business. And in an effort to remain loyal to my journalism roots, I won’t bury the lead. Good rockwork enhances the guest experience at any themed attraction. It transports the guest into an immersive environment as well as distant times in the geological record. A healthy economy has recently bolstered sales. The uptick has mainly been in four market sectors: zoos, botanical gardens, museums and waterparks. Clients in these spaces rely heavily on a rockwork team’s expertise due to the fact it is such a tricky business. Rockers are skilled professionals. They study real rocks and how they form, and then take those observations and turn concrete into art. And they can simulate any kind of rock out of shotcrete that Mother Nature once formed. Like any secret sauce, every Rocker has their own recipe. Shotcrete provides the structure and is made up of portland cement, fly ash, sand and an array of admixtures for plasticity, waterproofing, integral color, etc. To achieve the right texture, you need enough aggregate, which allows the surface to be shaped and smoothed. Finished rockwork jobs should last nearly three decades without cracking. The end product is a landscape that creates a natural environment or a fantasy that transports guests to another time or dimension. “When the public can’t tell if it’s artificial and they have to get up close and touch it to see if it’s real, well that’s a sign of good rockwork,” says Gil Martinez, rockwork artisan. Gil is part of a nomadic group that relishes creating one-of-a-kind, memorable pieces all over the world. Photo op and/or “Wow” status might be another sign of success. 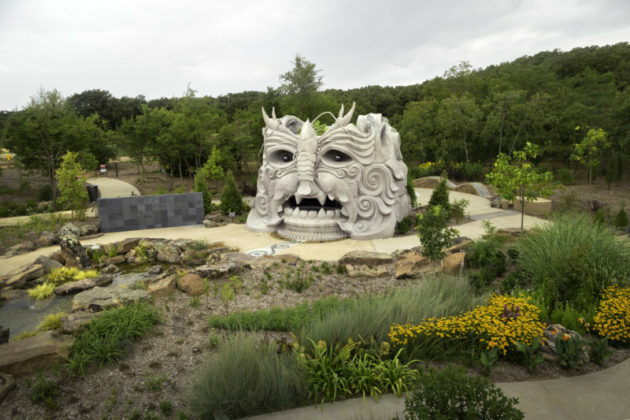 Gil and his team at the Weber Group were tasked with creating a larger than life sculpt we refer to as the Spring Giant, at the Tulsa Botanical Garden. The base is concrete and artfully transforms into what appears to be chiseled limestone. This piece de resistance has become a Hero moment for guests taking pictures at the Children’s Garden. With any rockwork job, there is typically a set of challenges. For the Spring Giant, crews were working during the summer in brutally hot Tulsa temperatures. Heat affects the shotcrete. If it’s too hot, it becomes weak and cracks. The ideal temperature is 60-degrees F (15C) in moderate humidity with a certain amount of moisture. Climate control is key and problem solving is part of the game. On another project, one for Great Wolf Lodge in Fitchburg, MA, Weber Group built a 40-foot tent and brought in portable heaters while sculpting The Great Wolf, a 37-foot-tall statue that greets guests entering the indoor waterpark resort. In that case, the frigid temperatures were freezing the mix too soon. A good rockwork team understands the risk variables and communicates with the client along the way to manage expectations. That includes the final stage of rock working – Paint. After the last piece of concrete is carved and cured, it’s time to paint. Tactical painting will bring the rock to life. These finishes are achieved with a mix of washes; spray techniques; dry brushing and layering. Finally, it is put under a clear coat for protection from visitors, critters and the sun preventing wear and tear. Good paint will give the rock that natural illusion or in some cases a lively, colorful pop which adds to the overall thematic scene. A good end product is usually met with rave reviews and applause. Themed rockwork elements are an additional draw and extend a guest’s total time at a property. Rockwork can also double as a means to hiding unsightly maintenance or ride equipment that can take a guest out of the moment. Zoos do a nice job with this. They hide traditional construction with landscaping or in some cases – rockwork within the animal’s habitat. This adds to creating a scene for the guest that feels like an authentic place where the animal lives – such as the jungle. It is a life sustaining environment for the animal that make them feel at home. Yes, a sense of escapism. A feeling of traveling without the travel. That is indeed what makes a happy rock. Carolyn McLean (carolynmclean@webergroupinc.com) is Director of Communications at Weber Group. She is a veteran of the amusement park industry holding former roles as VP of Corporate Communications for Cedar Fair Entertainment and Director of Communications for Six Flags Kentucky Kingdom.